Grand Theft Auto IV has been in my possession since midnight Monday in a Los Angeles mini-mall. Because the game is rated M for Mature, there were a few eager teens milling around in the parking lot, trying to bribe cool adults to get them a copy. What's worse? Buying teens cheap vodka or immersive sociopathic sandbox crime simulators? There seems to be a lot of time in the game allocated to text messaging, going on the Internet, and online activities. I wasted my life in Grand Theft Auto: San Andreas pretending to work out; now I'm wasting my life in GTA: IV pretending to surf the web. The online multiplayer experience is outstanding. Exciting, chilling, and oh-I-just-got-run-over-by-a-garbage-truck messed up. Racing, sniping, exploding, hiding  the diversity of attack strategies available allows for a ride that will never get boring. 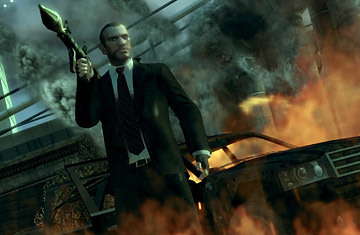 Ultimately, the multiplayer for GTA: IV is so engaging it might actually overshadow the story. When I wake up in the morning, exhausted and sick with self-loathing from playing till three in the morning the night before, multiplayer is what calls me back. It's so good, I may never get to 7%.